Comments/Context: This is an intimate show in one small room, focusing on Kikai's city scenes from Tokyo. 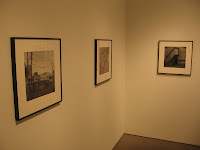 Kikai's excellent portraits from Asakusa were recently on display at the ICP show of contemporary Japanese photography (read review here), so it is interesting to see another set of his work to get a better feel for his overall approach. Unlike the sometimes stark and severe geometries of the New Topographic photographers of a generally similar time, Kikai's city images are clearly in the humanist tradition, even if they are filled with telephone wires and building forms. While there are no people in the pictures, there is clearly a warmth and interest in the lives of the inhabitants. Imagine mid career Kertesz had spent time in Tokyo and you'll get a flavor for this work. Collector's POV: The images are priced at $4400 each, which seems reasonable, even if there isn't much secondary market for his work and these are later prints. I particularly enjoyed the staircase image from Wakabayashi and the windows as eyes image from Shakujiicho.